Bet you're thirsty already! You'll have to wait till February 16th, however, as that is when the first New Mexico Cup competition/festival takes place at the Albuquerque Convention Center. 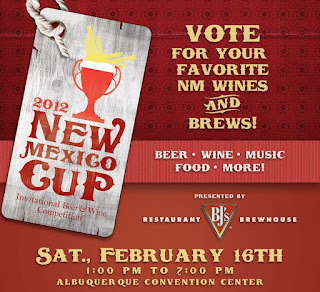 The New Mexico Cup differs from other fests in that the lineup of New Mexico beers (and wines...who let that stuff in?) will be critiqued by celebrity judges (will there be a Caleb Crump sighting?? ), professional judges (people in the biz who know their stuff), and you, the ticketholders. If you aren't holding your ticket yet, go here to purchase. General Admission tickets cost$20 and include unlimited sampling of NM beer and wine from 2-6. For $30 you can get a VIP ticket that allows you that important extra hour of drinking with entrance at 1. If you're still coherent by 6 pm, stick around for the awards ceremony. Hoist the winning brewers on your shoulders and take a victory lap downtown! Relish in the applause from the drifters outside the train station! There is a $6 parking fee at the Convention Center, so get mom to drop you off. Vendors will be onsite so there is no need to sneak that summer sausage in. And it wouldn't be a fest without music- though bands are still being finalized, you can be sure that you will hear something musical. I'm hoping it will be something that lets me show off my "Wonderbuns" dance.